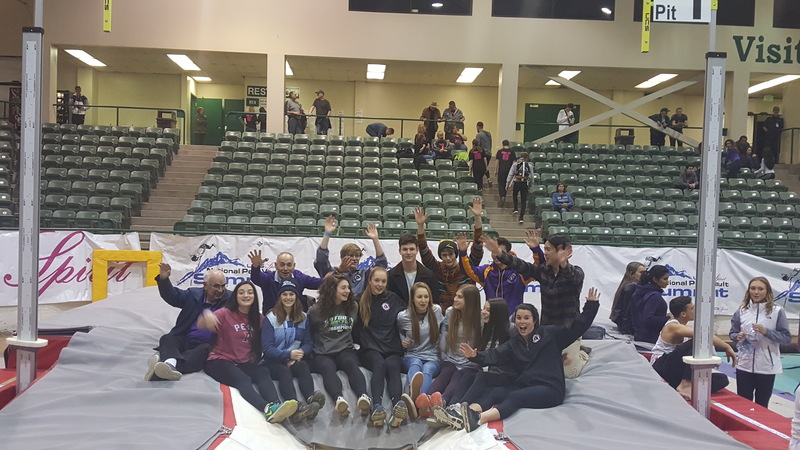 Hudson Valley Flying Circus | 2018 RENO SUMMIT POLE VAULT FUN !!! SUPER RESULTS !!! 2018 RENO SUMMIT POLE VAULT FUN !!! SUPER RESULTS !!! The FLYING CIRCUS FAMILY WENT WEST!!!!!! YES——- 32 Flying Circus ATHLETES—PARENTS—COACHES traveled to the …” 8th WONDER-of-the-WORLD ” … The UCS SPIRIT NATIONAL POLE VAULT SUMMIT this past weekend in Reno,Nevada and what a learning experience it was. It’s true…..when young teams start bonding together… building mutual respect for each other…and showing compassion for each other…… the world gets brighter in every way. This is the character building blocks of scholastic athletics. Character development is the mission of sport @ Flying Circus. Let’s pass -it-on to everyone!!!!! CONGRATULATIONS and THANK YOU ALL for a SUPER SUMMIT!!!!!! ALANA CARROLL…12′ 8″ ….TYLER HRBEK… 14′ 6″ lead a STRONG CIRCUS TEAM !!! There were 17 athletes competing… and… 17 wonderful stories to be told at this 30th NATIONAL SUMMIT sponsored by UCS Spirit and directed by Mr. Steve Chappell. The 2018 version was perhaps..the best ever and largest ever (over 2, 2000 athletes/coaches/parents) treated to 2 days of non-stop pole vault excitement. From the Beginner athletes ..to the Olympic Champions…the Hall-of-Famers … to the Rising New Stars… IT WAS A HAPPENING !!!! We will make the technique adjustments and apply them to each member of our little club…. It’s time to raise – the- bar in training!!!!! Leading Girls department was Alana Carroll(Averill Park,NY) with her 12′ 8″ New Indoor School Record in Pit #1… This Harvard bound scholar was close at 13′ 2!!! Backing her up on Pit #1 was Abby Norwillo(Pittston Area,PA) at 12′ 0″ and big all night at 12′ 8″!! Kicking up her speedy heels…was Coach Stephanie Duffy…coached by Sparky Thompson all night…and 12′ 0″ jump for 3rd on Pit #5 Open…. Taking the gold medal on Pit #3…was Warwick Valley,NY Kaeli Thompson at 11′ 8″ and big over 12′ 2 bars. Winning Gold at Pit #5 was Ridgwood,NJ senior gymnast..Nicole Lester with her all-time PR 11′ 6′ leap for the Maroons.. Backing her up on Pit #5 was Lauren saifi(Gov.Livingston,NJ) with a second place 11′ 2″ PR. Northern Valley-Demarest,NJ junior… Sydney Woods looked fast again with her 11′ 4″ soaring… Holy Angels,NJ senior..Bucknell bound honor student ..Caroline McGann was ready and made 10′ 8″ by a ton on her bigger poles of the early season… Greenwick,CT Champion..Lia Zavattaro flew 10′ 4″ from short run.light pole for next years Bison recruit… Making some great jumps at Pit #11..was 8th grader,,Chloe Pasek of West Milford,NJ… with 7’8″ make and close at PR 8′ 2″ !!! The most exciting new on Friday Morning and Friday Night Pro vault was our very own Megan “Flips” Clark of the Olympic Training Center’s Chris Mack group. After a national “shout out” in the morning session.. Megan flew big all night over 14′ 2 and 14′ 7″ brush off…. her positive attitude was the class of the field!!! She will be in the 111th NYRR MILLROSE GAMES on February 3 at the ARMORY!!!! The Boys/Men’s group was lead by Northern Valley-Old Tappan,NJ…senior Tyler Hrbek… with his 14′ 6″ zoom over for Coach Jeff Clark on Pit #4. Tyler was invited to NYRR MILLROSE GAMES jr. Valet Event on Thursday February 1 at 6PM!! Also sailing was warwick Valey,NY senior sprinter/vaulter..Dane Sorensen over 14′ 4″ by a foot!!! Dane was also invited to NYRR MILLROSE GAMES based on his 15′ 0″ Armory Vault. Jona Kim(NV-Old Tappan,nJ) was solid at 12′ 10″ bar… Coach Will Nesbitt(Garrison,NY) ..came off his flu sick bed to place 2nd on Masters Pit #6 at 12′ 6″ and close at 12′ 10 for the former Dukie….Jacob Becher was ruling Pit # 11 in the late afternoon.. and produced his best on indoor at 10′ 8″ and 11′ 0″ for the Warwick Valley Flash(Junior)… Carlton Huff.. of Vault Factory was inspiring all weekend and hit 10′ 4″ in Masters Comp for Coach Carl. “Big Air” was Seth Kricheff of NV-Old Tappan,NJ… this senior also is one of the 14 athletes invited to NYRR MILLROSE GAMES next month!!! We will be taking of technique training up to and include all UCS Summit Clinic Level 3 Drills and Progressions. Get ready for some Mid Season changes!!! !